SKODA is revealing several details about its new KODIAQ RS ahead of the high-performance SUV’s official world premiere at the 2018 Paris Motor Show in October. In a video, ŠKODA is offering a preview of the car’s full-LED headlights, the virtual cockpit and the new Dynamic Sound Boost function, which accentuates the dynamic character of the ŠKODA KODIAQ RS with a meaty and even sportier sound. With the most powerful production diesel engine in ŠKODA history (240 PS), all-wheel drive and adaptive suspension, the KODIAQ RS is the brand’s first high-performance SUV. This dynamism is emphasised by the crystalline-effect full-LED headlights, which come as standard, and the typical ŠKODA design language. 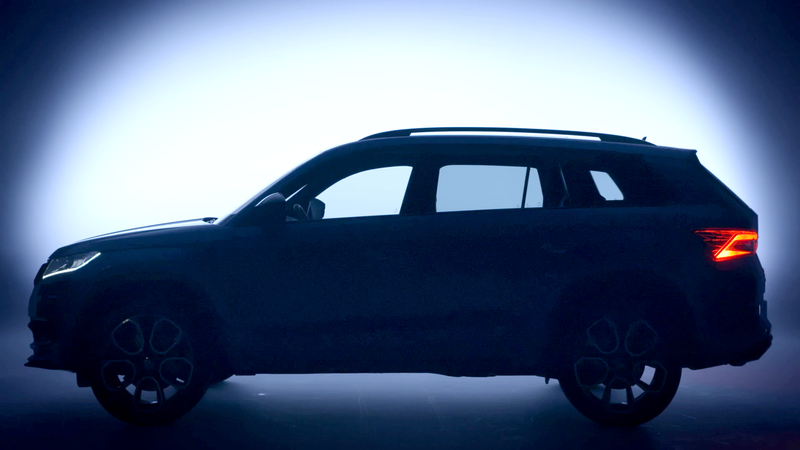 The video shows the optional metallic Race Blue finish, which is available for the first time in a ŠKODA SUV. Standard equipment in the ŠKODA KODIAQ RS includes the individually adjustable virtual cockpit in a carbon surround. ‘Sport’ is a fifth display layout which features the rev counter and speedo in the centre. The KODIAQ RS is the first-ever ŠKODA model to offer Dynamic Sound Boost. This sophisticated system uses the data from the cars electronic systems and varies and intensifies the sound of the engine depending on the selected driving mode. This results in a captivating acoustic experience, which makes the ŠKODA KODIAQ RS even more enjoyable to drive. ŠKODA KODIAQ RS will be introduced to the public all over the world for the first time at the 2018 Paris Motor Show in October. Looks to be the same as Sportline. A bit disappointed, hope they're playing with us and just put Sportline bumpers just to surprise us come Paris. ŠKODA is continuing to whet appetites for the new ŠKODA Kodiaq vRS. Ahead of the car’s official world premiere at the 2018 Paris Motor Show in October, the Czech manufacturer is releasing yet more photographs of its features. The first SUV in the portfolio of ŠKODA vRS models impresses not only with its 240 PS diesel engine, but also with its sporty and elegant design, highlights in high-gloss black and 20-inch Xtreme alloy wheels. ŠKODA’s first high-performance SUV brings its dynamic ambitions to the fore with plenty of black accents – its striking radiator grille, roof rails, window frames and wing mirrors all come in high-gloss black. The rear is shaped by two visible tailpipes below the bumper and a reflector that extends across the entire width of the car – the distinguishing feature of all ŠKODA vRS models. The ŠKODA Kodiaq vRS rides on 20-inch Xtreme alloy wheels as standard, while the red brake callipers are clearly visible. With this combination of sporty looks and power, the all-wheel-drive SUV clearly sets itself apart as the most remarkable model in the ŠKODA model range. The new vRS logo also makes its debut in the high-performance SUV, with the ‘v’ for victory finished in eye-catching red. 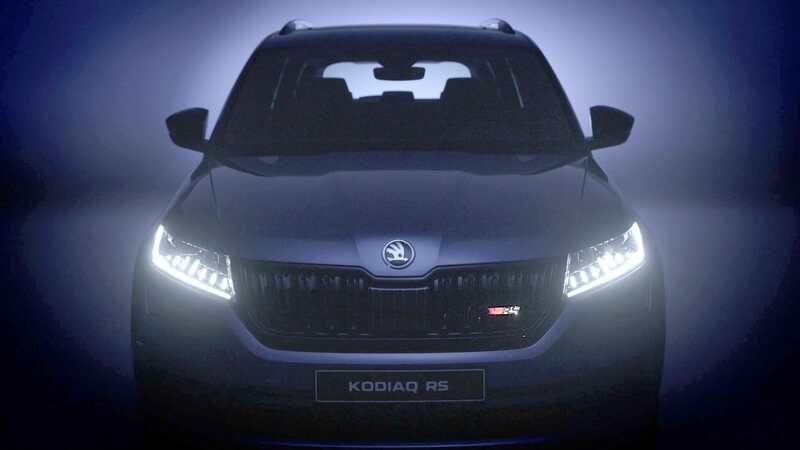 This new colour symbolises the sportiness and power of the vRS family and the logo is prominently placed on the radiator grille and rear of the ŠKODA Kodiaq vRS. The brand’s first vRS SUV will celebrate its world premiere at the 2018 Paris Motor Show in October. Looks not too far from a SportLine..... maybe its whats under the skin!. Asked my local dealer today about any details on the Kodiaq VRS as I was half thinking of changing my SportLine order once the VRS order books are opened. Response from the dealer was luke warm tbh..... they said from what they have seen it seems to be very much a SportLine on looks with the usual VRS bits like unique colours, coloured brake callipers, visible exhausts but the bigger engine & uprated suspension will be the main difference. Maybe I’m biased but I think I prefer the 20s on the Sportline and the Matt effect around the windows instead of gloss black on the Vrs. I have no desire for a diesel either so it’s not making me regret my choice. I like it. I wish they did non 20” wheels or that engine in an Edition or L&K version. I’d buy it instantly over the other engines on offer. I just don’t want such big wheels anymore. The U.K. roads are simply too bad. I’m definitely interested in this when it’s released and it coincides with my contract hire stopping. The more powerfull 237bhp engine is long overdue. I also like the rear exhausts, although the Sportline has similar fake exhausts they really do look fake (like many in the market). Brighter colours are also welcome. Hopefully the other small touches will set it apart from the Sportline but the vRS badge does it for me. I had an Octavia vRS before the Kodiaq and loved it, a great compromise between economy and power. I find the Dealers Luke warm reaction odd as they will shift allot of vRS’s. looking at the competition (LR Discovery Sport for example) I don’t see anything in the same spirit as the vRS, if they did it would £20k more and wouldn’t offer much more for the premium. I was surprised at the dealers reaction but after speaking to the sales manager for a little while they seem a little nervous of a Skoda hitting the £40k mark.... he said many in the UK still have a perception of Skoda which work brilliant in the sub £40k market but above this people will think twice vs other market options. He said Sport Line models haven't sold too well in the UK again due to people opting for the more 'value' trim levels.... personally I'd love the vRS !! !